Lucy Forman is one of the PhD students in the team, and moved from the UK in March 2013 to begin her research in this beautiful country. She graduated from Imperial College London in 2012 with an MSci in Geology & Geophysics and is now very excited and blessed to be working on such a fantastic project! Lucy’s primary focus is detecting extralunar fragments in lunar soils collected on the Apollo 14 mission to the Moon. 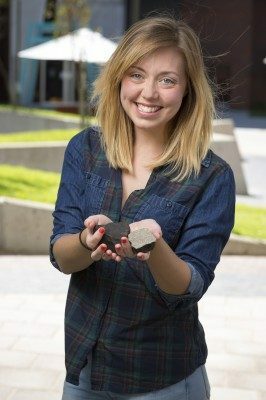 She hopes to see a wide variety of meteorites from different parts of our Solar System, and is eager to see what she can find. Whilst Lucy is not strictly working on the Desert Fireball Network, she loves to help out with building various components and providing extra people-power where she is able. Lucy has found it fascinating watching the development of the ADFN project and counts herself very lucky to be able to contribute towards it.